Lisbon, the capital of Portugal, is one of Europe's most alluring cities. Set on the banks of the River Tagus, this vibrant Atlantic port is scattered over a series of hills that heighten its splendid waterfront location. Exploring the city's historic core is a journey into its fascinating past - a heritage exemplified by celebrated visitor attractions such as the mighty Castelo de São Jorge and Alfama, the oldest part of Lisbon. A collection of world-class museums extends the cultural experience. To the east, away from the city center, you can marvel at the modernity of Parque das Nações and its crowd-pulling sites such as the brilliant Oceanário. Across to the west in Belém, Portugal's golden Age of Discovery is mirrored in the magnificent Mosteiro dos Jerónimos and the quirky Torre de Belém, both UNESCO World Heritage Sites. In between, you can amble across handsome tree-lined squares; stroll along broad, riverfront esplanades; or take in jaw-dropping panoramas from the various miradouros, or viewpoints, dotted across the city. Enchanting Sintra is one of the gems in Portugal's glittering sightseeing crown. Recognised by UNESCO for its remarkable cultural landscape, this historic and captivating town is definitely worth putting aside a full day to absorb. Clustered under the lip of the wooded Serra da Sintra hills, the town is dominated by the landmark Palácio Nacional, its signature twin chimneys looming over a pretty square edged with houses painted in a palette of pale pink and ochre with splashes of yellow. Peering down over this picture postcard setting is the ancient Castelo dos Mouros, seemingly hewn out of the granite escarpment it runs along. Crowning the highest hill is the bewitching Palácio da Pena, used in the 19th century as a summer retreat by the Portuguese royal family. Sintra offers plenty of hiking trails for the avid walker, but you'll need a stout pair of legs to conquer the demanding hills surrounding the town. The highest points of the serra offer breathtaking views across the Atlantic coastline and distant Cascais. With its robust granite architecture and commercial disposition, Oporto, Portugal's second city, rewards visitors with a very different experience to that of the capital. Sited at the mouth of the River Douro and blessed with a waterfront - the Ribeira - acknowledged by UNESCO as a World Heritage Site, Oporto is a destination endowed with Baroque churches and Neoclassical buildings that number some of the best examples of their kind in the country. Of particular note are the needle-like Torre dos Clérigos and the imposing Sé, the city's cathedral. Another landmark structure is the iconic Ponte Dom Luís I, the spectacular double-decked iron bridge that spans the Douro and connects the city with Vila Nova de Gaia. A leisurely stroll along the Ribeira delivers a tangible sense of history, where you can breath in the briny atmosphere of the place. The river provides a scenic route to the Douro Valley, a verdant landscape of terraced hillsides dotted with hamlets and villages. A popular sightseeing option is to join one of the many cruises that ply the meandering waterway. Deep in the heart of the Alentejo is Évora, one of the most beguiling destinations in Portugal. Renowned for its amazing ensemble of well-preserved monuments, Évora deserves close and unhurried scrutiny. Its medieval walls enclose centuries of history, a timeline illustrated by the impressive Templo Romano, which dates from around the second century; the brooding but compelling 12th-century Sé (cathedral); and the Igreja de São Francisco, with its lugubrious Capela dos Ossos, completed in the mid-1550s. The historical significance of Évora and the unspoilt condition of its architectural treasures has won it coveted UNESCO World Heritage Site status. But you'll also be taken with the city's delightful market-town ambiance and down-to-earth personality: it's a pleasure to wander and shop through its Moorish alleys; browse engaging museums; and lunch in attractive squares, where you're considered a guest rather than a tourist. What does a king give his queen for a wedding present? For the lucky queens of Portugal, it was the achingly pretty town of Óbidos, a custom that prevailed for hundreds of years. These days, it's gifted to the general public, and it's certainly worth the hour's drive north out of Lisbon to reach it. 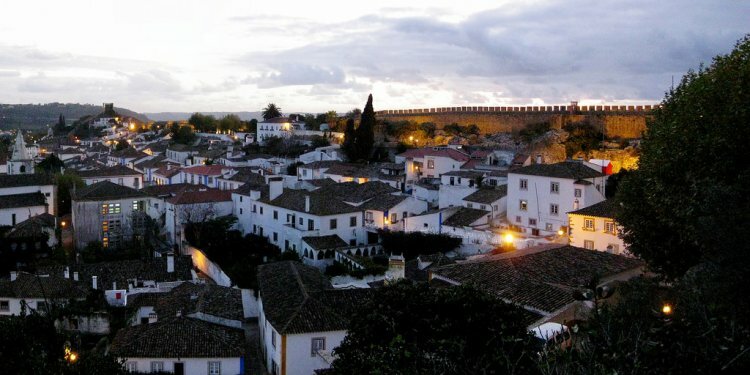 Óbidos is an artist's dream. An assortment of whitewashed cottages, cafés, and handicraft stores lining a series of narrow, cobbled streets are completely enclosed by sturdy medieval walls. There's also the Igreja De Santa Maria, which features a wonderful interior of blue and white 17th-century azulejos (tiles). A museum on the town's attractive square includes rare works of art by the 17th-century painter, Josefa de Óbidos. You can walk along the top of the battlements for lovely views over the terracotta rooftops and the lush plains beyond. The fortifications form part of the landmark castle, whose keep looms guardian-like over the charming scene below. The castle itself is now a pousada, an upscale period hotel. Cited by many a guidebook as the most captivating town in the Algarve, Tavira does indeed tick all the scenic boxes. The Rio Gilão cuts a smile through this pleasantly laid-back town, with a Roman footbridge connecting one side with the other. The waterfront makes for a wonderful walk, before or after you've uncovered the rest of Tavira's historic treasures. The castle walls provide glorious views across the old town and the nearby coast. You can also explore the Igreja de Santa do Castelo, the grandiose church where warrior knights are entombed. The town also boasts a fascinating museum, the Núcleo Islâmico. Highlights include a rare 11th-century figurative vase. An appealing option, especially during the hot summer months, is to visit the offshore Ilha de Tavira, an enormous beach that, even in high season, has plenty of room to spare. It's reached by passenger ferry from a jetty at Quatro Águas. The Algarve is justly famous for its pristine coastline, and one of its natural wonders is the Parque Natural da Ria Formosa. This protected marine habitat constitutes a 60-kilometer stretch of marshland, saltpans, shallow water lagoons, and sand dune islands that run from Quinta do Lago east past Faro all the way to Cacela Velha. Where to Travel in Brazil?